Joshua 1:7 Be strong and very courageous. Be careful to obey all the law my servant Moses gave you; do not turn from it to the right or to the left, that you may be successful wherever you go.8 Do not let this Book of the Law depart from your mouth; meditate on it day and night, so that you may be careful to do everything written in it. Then you will be prosperous and successful. This week we are taking a peak into a COURAGEOUS life. How can we be strong and courageous in every area? Yesterday we looked at how to keep thinking straight. Today we see how important it is to speak out. But we must speak the right things. Reading on in our verse we see that it says don't let this Book of the Law depart from your mouth. In other words, you and I have got to keep speaking this word to each other and to ourselves. Courageous Voices speaking courageous words. Speaking out rather than holding in. Faith comes by hearing. We speak it not so God can hear us reading but so that we can hear it. That's how we get our power! I encourage you to find yourselves some key verses in the Bible and commit them to memory this year. Get them in your brain and know them so that they drop down into your heart. Your spirit will come alive and it wont be long until you are talking about God in God's language all the time! 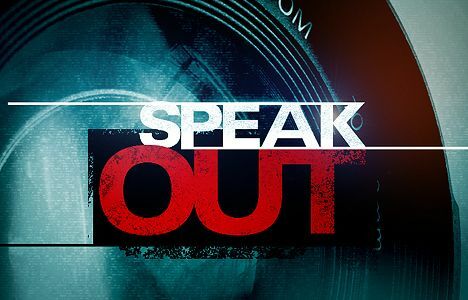 So speak out!